More for my own records (because I find it convenient to search here for things I have been to) than to inform the world at large, I just mention two musical performances which I went to in December which have so far escaped notice here. At this distance I cannot presume to say anything detailed. This was de Waart’s second program, and strangely passed with less attention than the first, even though it had at least one of his party-pieces (the Elgar). I enjoyed this. Last night I heard an (unannounced) performance of the Elgar starting on ABC FM just on midnight and thought: “de Waart’s wasn’t as slow as that.” Actually, for all I know, in absolute terms it may have been, but I do not remember the performance as from the pompous Empire end of the Elgarian spectrum. The Ross Edwards was another almost shameless rehashing of an earlier work – nothing wrong with that, but I would have preferred if instead the SSO paid Nigel Butterley a better tribute this year than they did (Arkcon put them to shame). We could have waited until mañana to hear another Maninya. At this distance of time the strongest recollection I have of Brautigam is his tremendous head of hair – probably on account of my own folically challenged state. This is a concert I would like to hear again but I expect I have missed the broadcast. This was sung in French with English spoken dialogue – which wasn’t as bad as I at first feared it might be. Entr’actes were provided by concertante pieces for mandolin (by Hummel) and flute (by Gretry himself) – the former more memorable (and apt) and the latter probably more helpful in padding out the length of an otherwise rather short work. It is possible to make too much of the parallels between this opera and Mozart and da Ponte’s Marriage of Figaro. Many of the common ingredients were stock of the period and the dramatic ones can be traced through the Beaumarchais play which was M and da P’s starting point. I wonder if I wasn’t in quite the right mood for this piece on the night as others have reviewed it more enthusiastically than I felt. I expect I have come to take for granted much of what Pinchgut is able to do which viewed from another perspective ought still to be counted a wonder. It certainly wasn’t disappointing – just a bit slight – which is the work really. I particularly remember bits of rather lovely Gallic fluteyness in the orchestral playing. 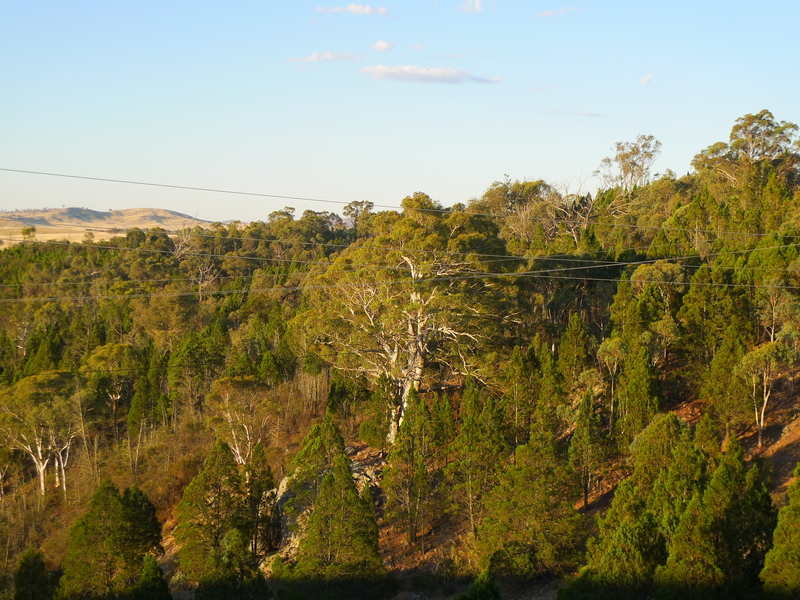 Two evenings in a row, heading out along the road towards Canberra’s water treatment plant, I spotted a raptor hanging out on this sunny hillside. The first night I saw it carrying what I guessed to be a rabbit from the rocky hillside below. The second night, no such drama, though I’m pretty sure it is in this photo, albeit rather indistinct. 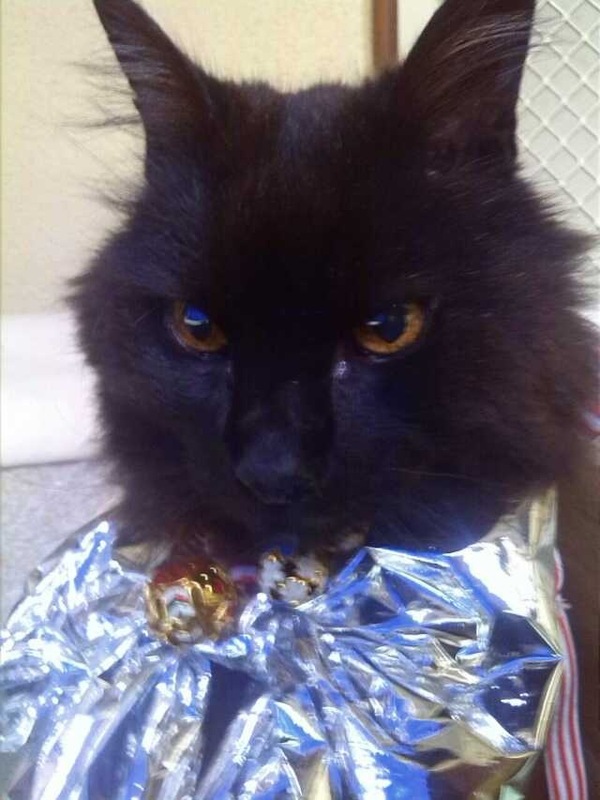 This picture of our cat, The Monster, was sent to me for Christmas 2 years ago by D. It is a bit blurry because it was taken with his mobile phone. It was The Monster’s 17th and last Christmas. Judging from his expression, that could well have been a relief if future Christmases were to involve any similar dressing-up. This Christmas marks 16 months since his last and fatal trip to the vet. We still miss him. Sometimes I dream about him. The general inspiration for this sort of thing seems to be Sydney Park, built in much larger former brick pits at St Peters. The park itself suffers at this stage from a dearth of trees or undergrowth. The (mostly) good councillors have kept the example of Sydney Park’s urban forest in mind in limiting opening hours to 7am to 7pm. In that case it should be possible to allow for some shrubbery without scandal. Aside from some corellas on the adjacent playing fields (attached in some way to the High School) the only bird we spotted which was not an ibis was a solitary heron – in the foreground shade in the pictures below. To be precise, against birds and bats. Do birds count as beasts? 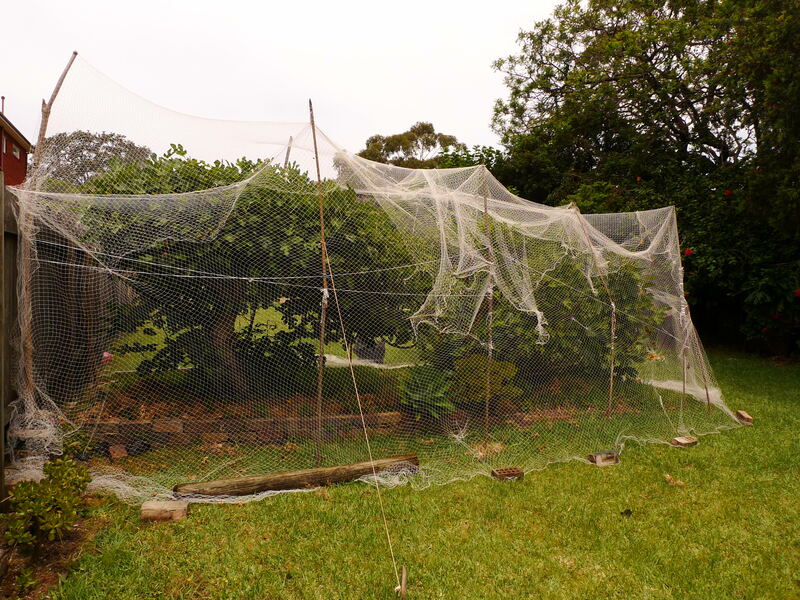 Whichever, there is no room for a compromise: both will take the figs as they ripen before we want to pick them, and there’s no reasoning with them (or between them, I suppose) for any division of the crop. I couldn’t have done this: it required D’s ingenuity and perseverance. I held the ladder perilous and pegged out a few guy-ropes with tent pegs from a tent my aunt gave me 15 years ago (which we have never used). 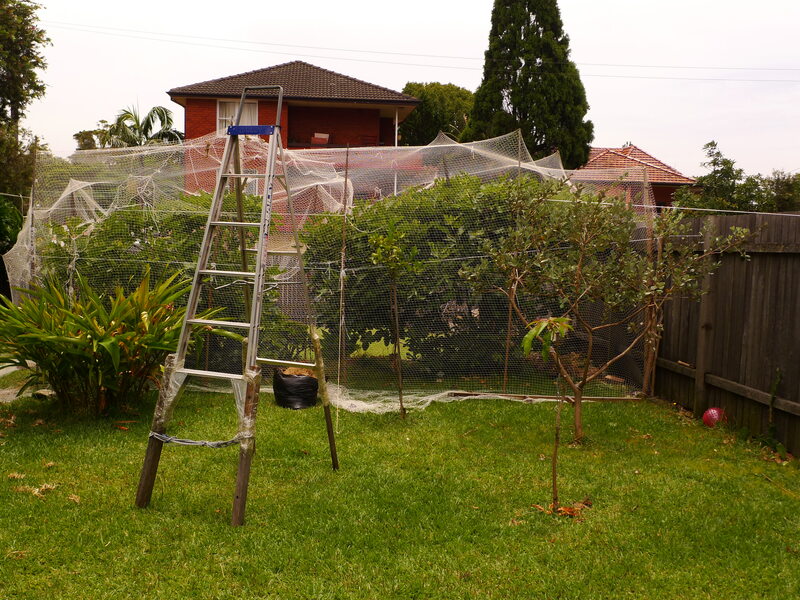 OK, I offered some gratuitous opinions from the foot of the ladder, mostly about the need to keep the net taut and well clear of the foliage. That’s a work in progress for the portion of the net in the top right quadrant of the picture above. There were more dramas with interlopers last season. 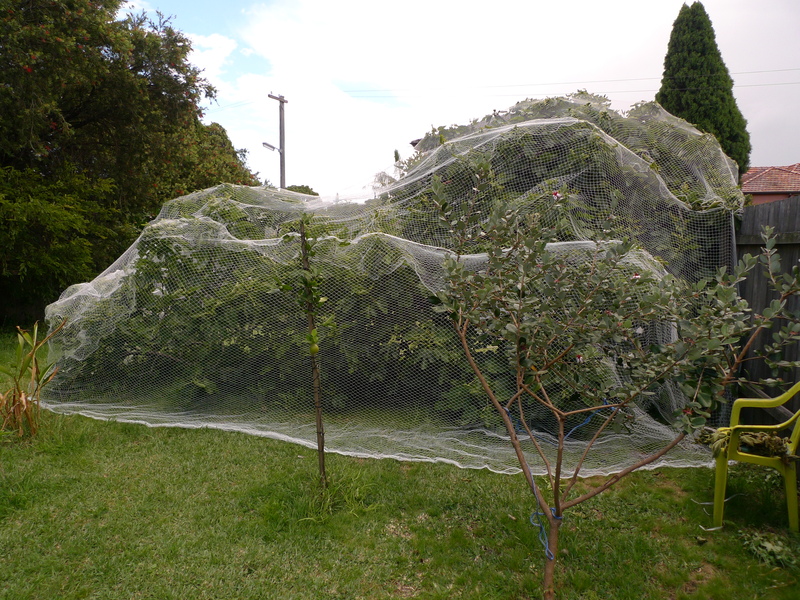 In response D pruned the trees considerably to make netting more manageable and effective. I have [now] watched [update] the first two three episodes all of the much-touted “TV Opera” The Divorce. General impression: cross between Marriage of Figaro, Kiss Me Kate, London Road and Miss Fisher’s Murder Mysteries; required some patience to sit through, motivated on my part by an interest to see how the public money and resources devoted to it by Opera Australia were acquitted and by the advance claims made for the project on behalf of the company. I am still trying to work out how this got to air. Apparently the score and book were originally commissioned by The Opera Conference from Joanna Murray Smith and Elena Kats-Chernin. It’s not clear whether it was to be a TV-opera at that stage, though all reason suggests not, since what interest would Opera Conference have in mounting a TV opera? The Opera Conference is a venture for sharing costs of mounting actual operas, surely? Without a single opera singer in the cast, and admitting it is “driven by pop/musical theatre rhythms” and “closer to the pop-influenced scores you hear in contemporary musical theatre”, why persist in calling it an opera? It’s clearly a musical theatre piece for tv. Not to put it down – I applaud the initiative – but why keep pretending it’s something it’s not? That’s not quite true. The Opera Australia chorus are a vocal presence – in the studio rather than on screen. Judging from the credits Sam Dundas and John Longmuir, actual opera singers, may be amongst the party guests though not, as far as I could make out, in singing roles. The first two episodes seemed oddly reminiscent of Miss Fisher’s murder mysteries – I thought at first this was just the posh Melbourne mansion and retro feel though now I wonder if it isn’t the camera work as well. And so far as retro-feel is concerned, there are even two gangsters, just like in Kiss Me, Kate. Original Concept: Lyndon Terracini AM. 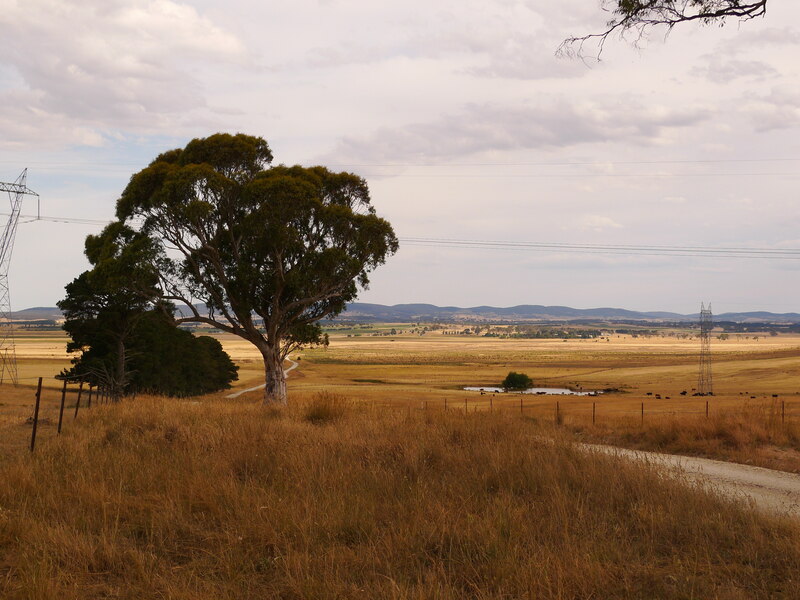 The Wollogorang Road runs between the Hume Highway and the Federal Highway. 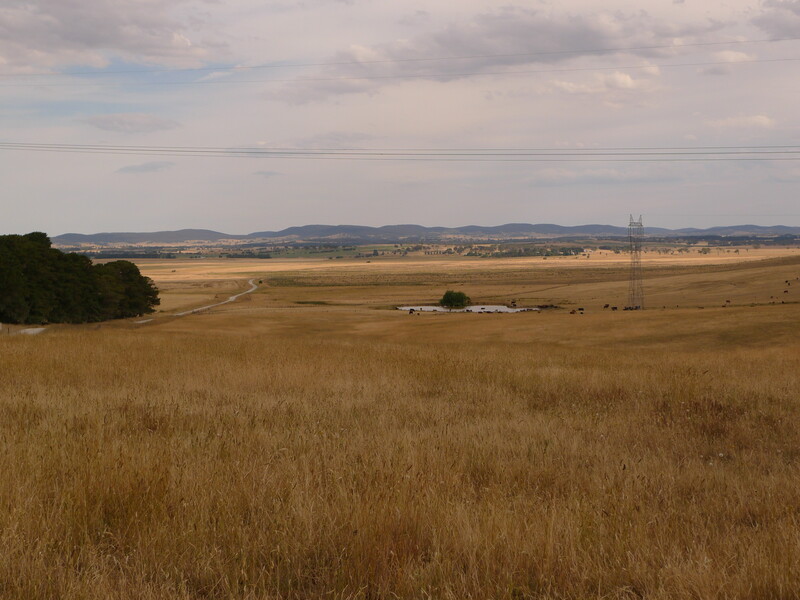 This picture is taken from the crest at the Hume Highway end, looking back the way I’d come from the Federal Highway. Afterwards I headed back the way I’d come. 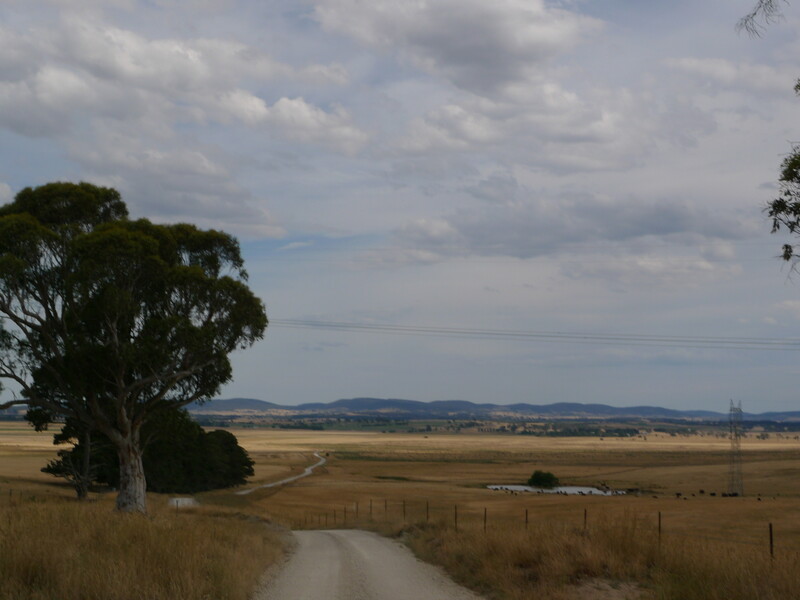 Maps show a blue patch for water to the left of this road but it is really just a depression which might sometimes fill with water – a very mini Lake George. 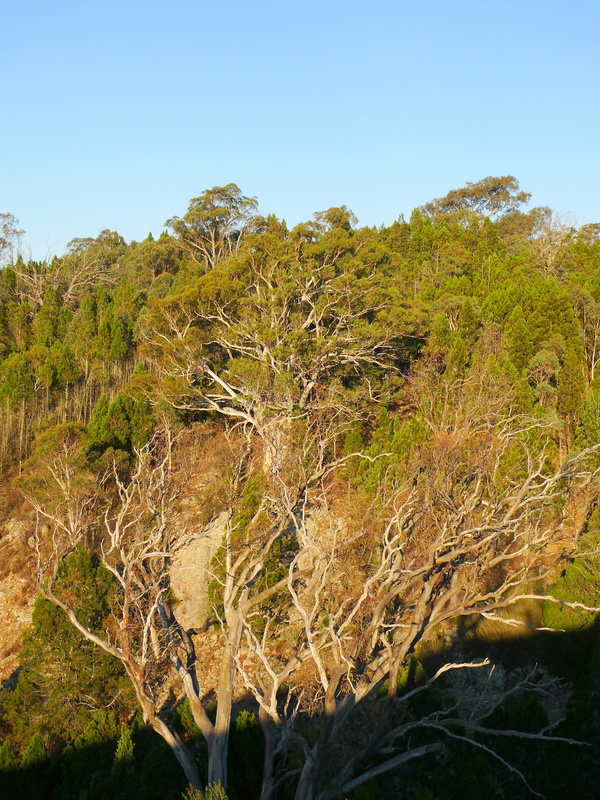 I stopped here to take a break from the ribbon of death between Sydney and Canberra. If possible, I like to get away from the noise of the highway. Just before I turned off, the announcer on ABC “Classic” FM mentioned that Berlioz’s Damnation of Faust opened that night in Paris. My friend, Ub, is in Paris just now. When I reached Canberra I sent Ub an email suggesting that, if possible, she should go to the Berlioz. I also sent Ub some of the pictures in this post. Ub told me the cheapest seats for DofF are 150 Euros; she’s not sure if she will be able to get to it. Ub also said she thought the pictures were sad. I hadn’t thought of them that way. Maybe from bustling Paris they seem so. You are currently browsing the Stumbling on melons blog archives for December, 2015.